The Galta ji temple is located at a distance of 11 km away from the Pink City, Rajasthan. This temple is one of the oldest temples among the district of Jaipur state of Rajasthan. This temple is famous for its pilgrimage from centuries which gives dedication to Lord Hanumanji as well as to Surya Dev. The Galtaji water tank is fed by pure water from a perennial spring. It is an old pilgrimage site of the Hindus and is located in the Khaniya-Balaji Indian state of Rajasthan. This pilgrimage site has several sacred kunds and temples. The pilgrims take bath in these sacred kunds. It is folklore that galav rishi spent his whole life in Galtaji and did penance and practiced meditation .this site is also of great importance to Vaishnavite Ramandandis. The holy site consists of temples, pavilions, natural springs and holy kunds. The Temple of Galtaji is famous for its natural water springs. Galtajii offers a picturesque view of the pinkcity. The attention of the visitors is grabbed by the natural water springs. Galta Ji temple was established in the 18th century and from that day onwards this temple is considered as the spiritual pilgrims in Jaipur, Rajasthan. This temple is situated in Jaigarh fort which is one of the famous monuments of Rajasthan. The temple has several holy kunds in it. By taking baths in this Kund one can wash all their sins. This Kund is flooded with many devotees during Makar Sakaranti. A large number of people come here during Makar Sakranti to take bath in this holy kund. The visiting hours for this temple are for whole day, from sunrise to sunset. The Galtaji’s main temple is built in pink stone and was built in the eighteenth century. This is one of the famous temples on the top of the hill. The temple contains a large complex as well and is known because of the large number of tribes of monkeys who lives here. The galta ji temple is located 100 beyond the Jaipur City to the east. 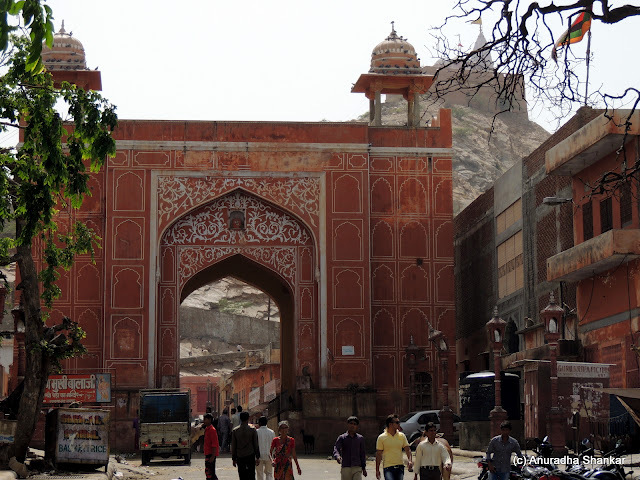 The holy place of Galta is 100m beyond Jaipur city to the east. You must Be conscious of the monkeys abode here. Flower and food may invoke an annoying response from the prehistoric ancestors of humans. One can take the bus up yo Vidyadharji ka bagh and from here you can hire an auto rickshaws or cabs according to your suitability for going to this temple. Jaipur is also connected to all major cities of Northern India through a National as wells as Sate highways. This temple is also known as Sun temple and this is the only temple of sun, this makes Galta ji as one of the important religious places. However the temple attracts a large number of tourists daily. When you reach near to Galta ji temple, a spiritual feelings develop in you. You can hear the chanting of religious hymns, or you can hear the prayers sung by the devotees. The location of temple is such that it provides awe-inspiring views of the surrounding plains.